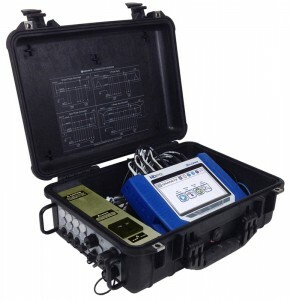 The Lockable Portable Case (LPC-HDPQ) is an IP65 rated case for the Dranetz HDPQ Visa, Guide, Xplorer and Xplorer 400 instruments. The Dranetz HDPQ instrument (not included) is secured inside of the LPC enclosure by using the keyhole mounting bracket that is included as a standard Dranetz HDPQ accessory. External weather resistant connectors are located on the side of the LPC for all measurement, communications and instrument power connections. Internal cabling is included (standard) that connects the instrument to the external connector panel – no modifications to the Dranetz HDPQ are required, and the instrument can be easily installed and removed from the LPC. The standard Dranetz HDPQ voltage measurement cables are used for all voltage connections, and the LPC includes (4) current probe adapter cables that adapt the weather resistant current connectors for use with standard Dranetz current probes. A weather resistant power cord is also included. Additional cables are available as an option for communications, CT cable extensions, and more. Dranetz LPC-HDPQ IP65 rated enclosure includes: power cord and (4) 16″ current probe adapter cables (Does NOT include HDPQ unit).